Follow This Plan To Turn £25 Into £1,000 In 3 Months! Note if you can start with £100, then it will only take 2 months to reach £1,000 as shown in Starting With £100. Check out the Which Plan Should I Follow for a comparison of the plans. The Week By Week Plan provides you with 3 to 4 Welcome Offers to complete each week. Each Welcome Offer may initially take up to 40 minutes (2 hours/week), but once you are familiar with completing Welcome Offers it can take as little as 20 minutes (1 hour/week). If your trigger and/or free bet has won on the bookmaker, it will take 1 working day for the bookmaker to process your withdrawal. As you will need these funds to complete your next offer, simply complete the next offer once your withdrawal has reached your bank account. You can start making profit today. In your first week, you will make £35 profit. From the second week onwards, you will make between £26 to £100 each depending on the advised Welcome Offers. Easy money! Could I make £1000 sooner? 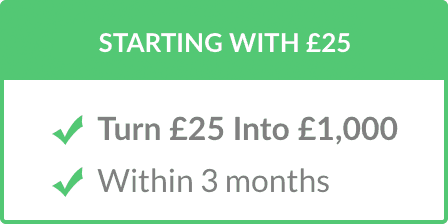 We are showing with the Week By Week Plan that you can start from as little as £25 and still make £1,000 within 3 months from matched betting. You can turn £100 into £1,000 in 2 months by following the Starting With £100 plan. Can I track my profit from £25 to £1,000? This week you'll be doing a couple more easy offers in the form of 888 and Skybet. After this it's a good idea to sign up and do the Smarkets offer as it's another exchange similar to Betfair, however the commission rate is lower at only 2%. Also you cannot lay bets from Paddypower off on the Betfair exchange as they are the same company, so in order to complete the Paddypower promotion next week, you will need a Smarkets account. Free Bet Odds - Just check the amount in your Betfair balance whilst deciding the odds to choose for your free bets. You should be able to choose around 3.0 for your £30 free bets, which requires around £50 Betfair balance. This will make you around £16 profit. By now you'll have made around £100 and have a healthy balance to be able to tackle more offers! Week 3 has some more simply Bet X Get Y offers which are extremely simple to do and you'll probably be able to complete them with your eyes closed now! (although I wouldn't advise it!). Week 4 will see you pass the £200 mark - great job! There's a fair amount of Betfair liability needed for the next week so you're going to focus here on finishing off some of the smaller Bet X get Y offers to boost your balance. If you have any money left in the bookies from this week, I'd reccomend withdrawing it ready for next week's offers. Congratulations on making over £200 profit! Now you're going to start completing the final bet x get y offers and move on to some slightly different types of welcome offer. You've probably passed the £250 mark now, or are very close. This week will introduce you to "refund" offers. Refunds are slightly different to Bet X Get Y offers in the sense that you don't get the free bet unless your trigger bet loses. You can still make a tidy profit from these and each guide will show you how. If you have an Oddsmonkey subscription you will find the refund offers a lot easier, and you can grab one below. This will be a final balance booster to make sure you have enough exchange balance before tackling the Bet365 offer next week! This week has the Bet365 offer this week which is the holy grail of Matched Betting. Make sure you have enough funds to complete the offer as it's an extremely high value offer but requires a fair amount of exchange liability. If you haven't got enough funds to attempt the offer, then simply do the other ones for this week and push the Bet365 offer back another a week. By now you'll have smashed over £400 profit from the bookmaker sign ups and even more if you've been sent some offers to your own email. This week has a fairly decent offer from Redbet. I'd really recommend signing up to Redbet as they have great price boosts and offers on that not many people know about. You'll also see 2 very similar bookmakers, both of which are from the same owner (Fun88 and 12bet). There's also a Boylesports offer which you can profit £14 from, however you can make so much more once you actually open an account as their reload offers are generally pretty good! Week 9 is your final week of bookmaker sign ups. Some of you may need an extra week if you've had to delay one or two of the offers such as Bet365 so if that's the case then there's no need to panic - just take your time! After this week you'll have made well over £500 with some offers that are arguably even better to follow in weeks 10 to 13. Firstly, a huge congratulations on your progress so far. You will be sitting on over £500 profit (and potentially much more) from your first 9 weeks Matched Betting. You may be wondering what exactly to do next as you've signed up to all of the websites, right? There are a few things you can do now to boost your profit and to keep making a monthly income which we will show you in these next 3 weeks. Firstly, check out the CashBack Sites guide. Don't be put off by the fact it's cashback sites as these are worth between £600-£700 alone and are really really easy to do. You can sign up and complete most of them in the two weeks if you withdraw as early as possible, so make sure you complete the whole guide or you're missing out! After this you should definitely attempt the Football Index offer. This offer is risk free and you will make at least £20 guaranteed for around 10 minutes work, with the chance of winning over £100+! Finally, you should move on to Reload Offers. What are these exactly? They are offers that the bookmakers offer each and every day to keep people betting with them. Some of them are just like sign up offers where you bet X and get X, others may be a little more complicated. Because of this, we recommend you sign up to OddsMonkey. They have a calendar with each offer available every day so you can make an extra £100, £500, or even £1000 a month! There's a £1 trial for 7 days if you visit through us here! It's imperative to have an Oddsmonkey account if you want to sustain your profits. If you found our guides useful we'd really appreciate it if you Refer Your Friends too. We pay £10 for every friend you sign up to us! So you've come to the end of Week 12 now and should have made around £500 from the Sports sign ups, £700 from Cashback offers and perhaps some more from reloads. Your bank should be well over £1000 from when you started with just £25! If you attempted a lot of the Cashback offers then you may still be waiting for some of the money to be tracked and paid and so your bank won't include the whole £700 ish from the Cashback sites just yet, however when the funds clear it will be. This can take up to a month, and in some cases up to a month and a half. Just be patient and you should receive it all! What do you do now? As explained in the Weeks 10 to 13, it's time to move on to Reload Offers. These will be your daily source of income. You've already signed up to the bookmakers, you've already signed up to the casinos via cashback sites - now its time to earn some consistent money from them; month in, month out.